“Merlin, my cat, is nine years old and castrated and he was also obese. Suddenly, around April 2008, I noticed he started to pee in the bathroom, which was quite unusual. Then I discovered that his box was flooded. After a few days I went to the store and protested that the sand didn't absorb the liquid. Certainly Merlin was slimmer each passing day, but as I had already started to give him less food in order to grow him thinner, I didn't understand it was also a symptom of diabetes. During some weeks I tried with different brands of sand, but always his box was flooded. By chance I met an old friend, a vet, and I commented him that Merlin was very good looking, slimmer, but his box was always flooded, and my friend told me it could be a hormonal problem. The following day he came home and made a urine check and took some blood to make an analysis. The strip immediately grew to signal diabetes. Next day he told me that Merlin had great levels of glucose in blood. He was a diabetic cat, and I had to learn to inject him. I was in terror. I had to change his food habits: now he eats special dry food for diabetic cats and only twice a day (before he eated ad libitum, and all sorts of food). At this time, Merlin is slimmer, not an obese cat anymore. First I wanted to try with homeopathy but it was to no avail. Then during one month, in August, my vet was on vacation and we tried with an oral medication, Minodiab. Nothing at all happened, Merlin still urinated and drinked a lot. I was really distressed, it was a very difficult month. Finally, in September, I started injecting insulin (Caninsulin). Merlin is such a good boy, he asked for his dose every 12 hours and even purred while I injected him. We started with a small dose of insulin and increased it slowly. He was doing fine with 2mmol in each injection. As he started to drink and pee less, I diminished the dose up to 1.8mmol. Then suddenly one night he had his first hypoglycaemic episode, at 4am. I was in terror, but as I was advised that this could happen, I started giving him honey and sugar, and after a while (an eternity for me) he reacted well. After this, the vet told me to inject only 1.4mmol, which was fine for three days, after which he had another hypoglycaemic attack, less dramatic this time. So we stopped injecting Merlin, and the blood analysis showed his glucose level is normal and he is in remission. Ten days have passed now and Merlin is doing well without insulin injections. He even drinks less than before (120 ml/day). I control his food, 35 grammes twice a day, as the vet says he should loose at least half a kg weight. I still use the strips to check glucose in the urine, whenever I catch him peeing (the result has been NEGATIVE during these last ten days) and he still eats diabetics food (and probably this will be his definitive diet). 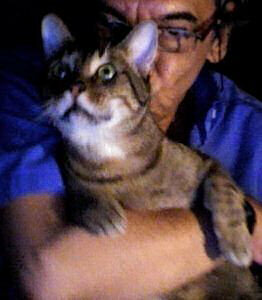 I'm attaching a photo of Merlin from August, during the most difficult time with his diabetes. I pray that his remission may be definitive, one never knows. Best regards and thank you once more for your site.